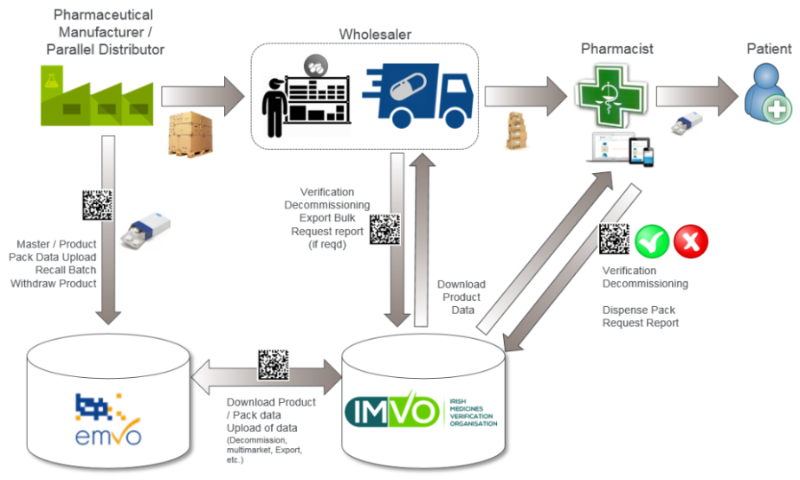 An EU-wide collaboration involving multiple stakeholders – pharmaceutical manufacturers and parallel distributors, pharmacists and wholesalers – is overseeing implementation of the unique identifier requirements across Europe. The stakeholder organisations in the pharmaceutical sector at European level have come together to establish the European Medicines Verification System (EMVS). At the heart of this is the European Medicines Verification Organisation (EMVO) which will manage the central ‘European hub’ that connects all the national and supranational data repositories in Europe and serves as the platform to allow the authenticity of medicines anywhere in the supply chain in the European Economic Area (EEA) to be verified. The EMVS is a cloud-based system. To the minimise the burden on national stakeholder organisation that are responsible for the establishment and management of the repositories systems, EMVO has designed a blueprint model that ensures practical and cost-effective implementation. This blueprint model includes a support plan or implementation package and a short list of preferred service providers, including Solidsoft Reply, the provider who is developing the Irish system.